Sarah Hearn’s Town Pavilion studio is part work space, part research center and part terrarium. 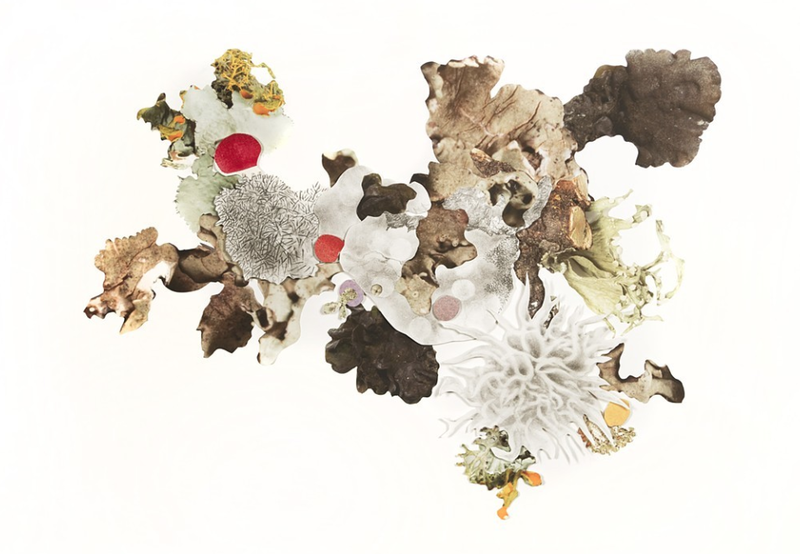 The interdisciplinary artist’s desk, windowsills and wall space are covered with lichen and photographs of lichen, along with intricate sketches and materials she’s been assembling for the past several years. 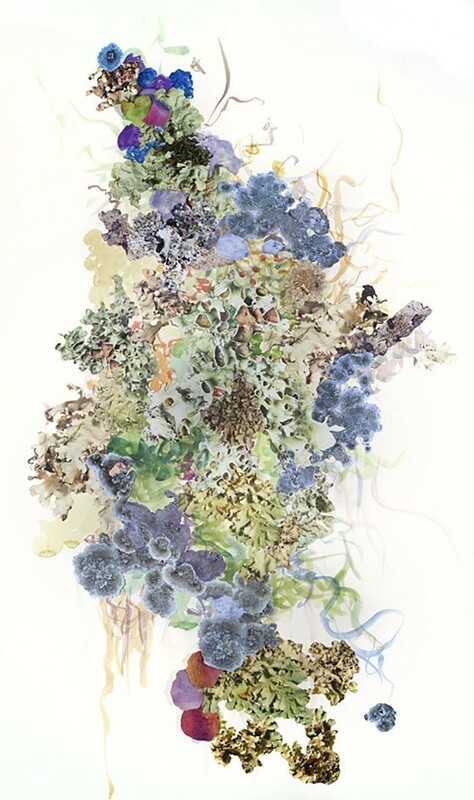 This month, Sarah announced the unveiling of Urban Colonization, a site-specific installation in which she will create and install artificial lichen colonies in various locations hidden throughout Kansas City. In this interview, she discusses the background and legwork involved in launching Urban Colonization this May. Essentially, lichen is a symbiotic organism that is only possible through a partnership between a fungus and an algae or a cyanobacteria — sometimes all three. 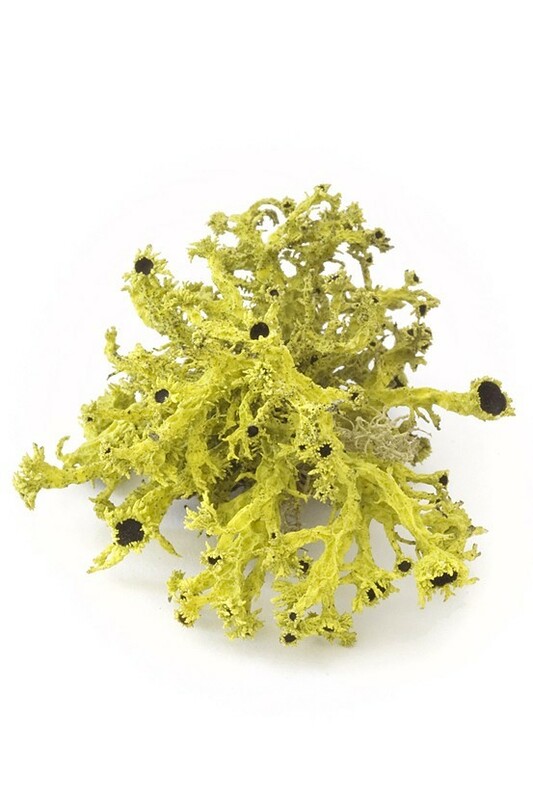 In order to fit within the biological classification system, lichen is grouped with fungus. But it’s not. It’s totally its own thing. How did you first get interested in lichen? While working on a project that dealt with ocean life, I learned about coastal marine lichens that depend on the tides to survive. Then, I learned that lichens can live on the occasional sea creature. The more I started researching it, the more interested I became. I read up on it a little bit and thought, wow, if this stuff is everywhere and can live to be 1,000 years old, I’m going to see how much I can find in my immediate surroundings. So I went outside of my home (in Oklahoma) and found four different kinds that were growing on my house. I’m really drawn to work with these everyday things that we take for granted. Where did you collect lichen? I am always looking for lichen, when out on hikes, camping, even on city walks, I notice it everywhere. For that first project, Symbiotic Cooperation, I invited the public to help me collect it. I asked for participants to mail 2-inch samples of lichen to me (or what they thought was lichen), and everybody who participated got a work of art in exchange. So I was behaving symbiotically, like the organism does. From that we got over 200 submissions of different kinds of lichen from 19 states and 4 countries. I spent the next year photographing, drawing and identifying it, and then I donated it to a herbarium in Oklahoma so that students can study it for future reference. Sheila Strawn, the woman I’ve been working with has a PhD in biology and is the only lichenologist in Oklahoma. We went to great lengths to verify what we had. I wanted to do something that would last beyond me just collecting and amassing it for myself, so donating it to the herbarium was a good way to do that. Now, my friends and family tend to send me lichens they find on walks, vacations etc. How do you identify what you’re looking at? Well to start I determine the type of lichen it is: fruticose, squamulouse, foliose, etc. Then, I go through the process of keying out the lichens characteristics. I use the book Lichens of North America as a starting point, and more specific regional keys to determine the genus/species. Then when I still have questions, I conduct chemical tests. I’ve gotten to a point where I know the general idea of what it may be. Sometimes I have it pinned right away. But what’s tricky is two different species can look identical, but have a totally different genetic makeup. There’s a lot more uncertainty in it than what I assumed going into it. Are there any species that really blew you away? The one that’s on the log (in the windowsill) is called Letharia Vulpina, and it’s just amazing. Not only does it smell great, it’s actually poisonous to foxes and wolves, which is why its genus species is named as such. It’s one of only two species that have that bright green-yellow color, due to the vulpinic acid it contains. That particular specimen came from upstate Washington, and its managed to survive in several non-native habitats since then. Then there’s some lichen that I collected in my backyard that died within two weeks of me putting them indoors, while others in very unnatural conditions are doing pretty well. What are some other places you’ve collected lichen? If I’m outdoors and lichen is around, I’m looking for it. The potential to collect is always lurking. Now I try to only collect specimens that are unusual to me, or different from ones I previously identified. Although I spent a summer in Ireland doing a residency, and there were some pretty spectacular specimens from there that I brought back. Part of it is sentimental value, and part of it is just that they’re beautiful and different than the stuff that I’ve been able to collect locally. Was it strange to travel with a suitcase full of lichen? Yes. I had some really interesting customs issues. I went through this huge process to legally get the lichen back in the country, and I had this official letter from the herbarium in Dublin, and I made it through Irish customs no problem. And then three hours through American customs, I was told “You risk spreading disease in the United States and you are therefore not allowed to bring them.” They told me that because my residency had been on a farm, I couldn’t do it, but if it had told them I had collected “this dried stuff on on a beach,” it would have been fine. So I had a huge stash of it that I couldn’t fly with, and I was really bummed. Fortunately I had mailed myself a box full of lichen that made it home two weeks after I did. “Dried herbarium specimens of no commercial value” is what they have to be listed as. What are you using all the photographs for? The photographs are really what I was after in the first place. I’m using them as a catalog identification of each individual specimen, but then I got interested in the idea of making my own artificial colonies out of the photographs, and so I started cutting them and assembling them in ways that they maybe wouldn’t grow in the wild, and so they sort of morphed into these things that include painting and drawing as well as photography. 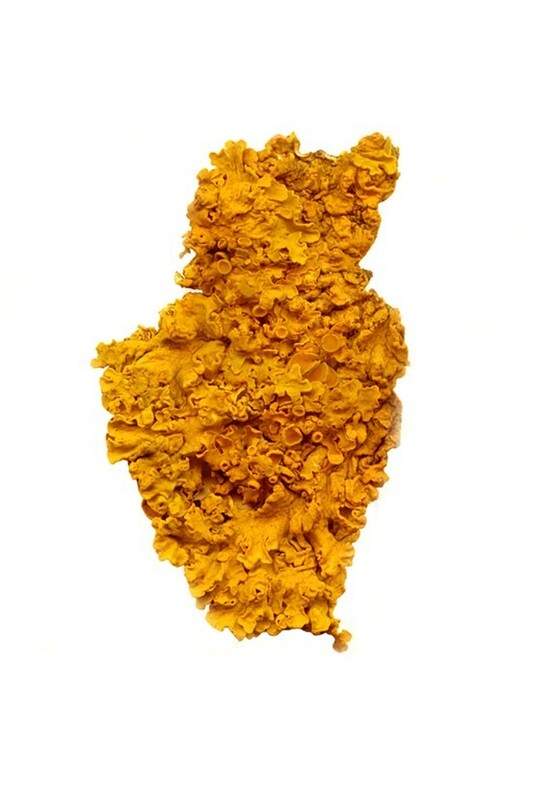 With the colonies that you plan to install in Urban Colonization, will you be using actual lichen? They will be artificial lichen colonies, but they will hopefully look so real that people will question if they’re artificial or real. Is it something that people will discover on their own? That’s possible. But another exciting development in the project is that I am working with a team of undergraduate students from UMKC to develop an app so that people can actually hunt for them at the multiple locations. It will work kind of like a geocaching app. Because the colonies will be installed in a variety of locations around town and there will be multiple colonies, it will give you clues to the next nearest one and give you a little code to read to see if you’ve got the right one. And then once people find them, they’ll be a photo-sharing system so that they can actually upload their images. What will the locations be? There will be colonies at Plug Projects, The Mid-America Arts Alliance, the Anita B. Gorman Discovery Center, and Science City at Union Station. What do you want people to gain from your project? I hope that people will pay more attention to lichen. When you really look closely, it’s this incredible, Lilliputian world that we just ignore, and it’s all around us. It’s sort of like nature’s white noise. So if I can call more attention to it so that we notice it more and maybe study it more, that would be great. Scientists have used it as an important biomonitor for the health of an ecosystem. So if the lichen population is devastated, then the community could be at risk for a lot of other reasons. It’s also been used to date architectural structures, especially in places like England, Ireland and Scotland. It’s actually more accurate than carbon dating, which is bizarre, but fantastic. NASA took it to space and it survived for a year and a half. Just the fact that it defies rules, that it’s really two species functioning as one, is to me a good example of what we can do when we work together. For updates, and to view more artwork, visit sarahhearnart.com. 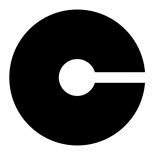 “Pavilionaires” is a recurring q&a series with current (and former) Charlotte Street Foundation Studio Residents. To take part, or to nominate someone, email Lucashwetzel at gmail dot com. This entry was posted on March 23, 2015 by KSMTH in Uncategorized.